We’d like to share something that’s been working really well for us on the Rattlesnake house project. Since I’m not in Cameron during the days of the week when Chris and Gary and crew are there working, Chris has taken to recording an update using Facebook Live each week. We have nothing but good things to say about this technique, and recommend it to any of you who can’t meet with your renovation teams in person. Now you know what’s going on with the house and get some fun commentary, too. Chris uses this technique to show where there are problems, where things went well, and what supplies we will need for next week. We can watch it when we have time, so we don’t need a long phone update. Since I’m plugging Chris, here’s his logo. 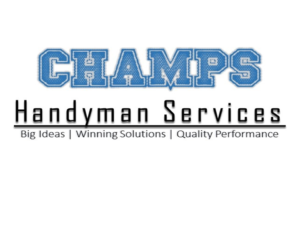 From the CHAMPS Handyman Services viewpoint, sharing these messages shows potential clients the care and skill they use on projects, and will be great for keeping good records of exactly what he did on this project. This is wonderful free advertising when we share it with all our fans on Facebook and this blog. Free advertising helps keep his costs down, which he can pass on to clients. It’s a win! Clients get a good idea of the variety of projects the team works on, which can only build confidence in them. 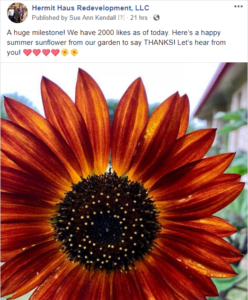 Here’s my Facebook post from yesterday, which has a lovely flower to draw people in. I boosted it. Yesterday was a good one for me in my social media director position. Our Facebook page hit 2,000 fans! Sure, there are folks with more, but for a really small company, I think we’re doing okay, so I’m tooting my own horn. Toot. One point I’d like to make is that, while it’s great to have a Facebook page and to post your blogs, photos, and other thoughts on it, there’s no guarantee people will actually SEE it. If a page doesn’t get a lot of likes, comments, and shares, the good old Facebook algorithms don’t make it show up in people’s feeds. It’s getting even harder now that the guilt-ridden folks at the company vowed to show you more from your friends and less from other entities. Your small business’s page is one of those “other entities,” you know. It’s not all good news, then? Who shall I be next? This dropdown is also handy if you forget which of your many “selves” you are liking and posting as. 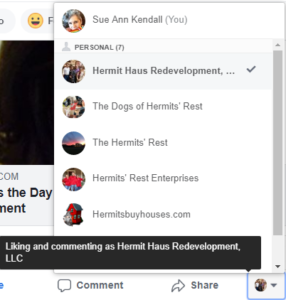 I prefer to comment as Sue Ann, not as Hermit Haus Redevelopment, but sometimes I forget who I am at the moment. More on commenting in a moment. Well, That Worked. Facebook Ads Rock. Last post about that conference I went to, I promise. This is the Facebook Business page about the ad we are running. We are spending $20 a day to market the house. All right, because I am the social media director here at this company, I went to all the social media sessions that were offered. The most valuable one, which was about using Facebook Messenger for business, I haven’t implemented anything from yet, but I WILL. But I sure got a useful tidbit in the other session, which was on successful online marketing techniques, by Ralph Plumb, a former pro football player who runs the successful FortuneBuilders MindProtein program, and was also one of the first guys who trained us in FortuneBuilders. ONE thing that Ralp said paid for my attendance, and probably even Lee’s non-attendance. 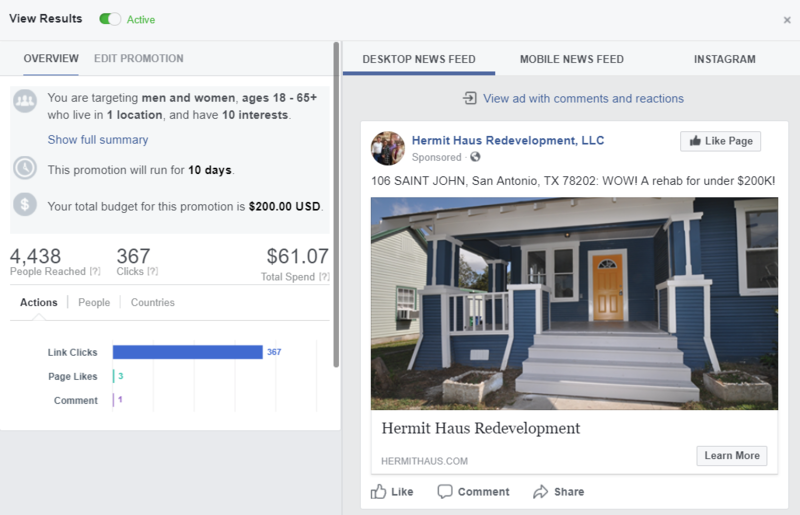 He said that Facebook is a great place to market your finished rehabs, but that the biggest mistake people make is to send people to the listing of their house on Realtor.com, Zillow, or another site like that. Yes, that takes them to your house, but it also takes them to every other house on the market. And if someone is interested, they contact some “preferred agent,” and that person is not YOU. You want to keep potential buyers in your world. Keep them on your website, have them contact your agent, not some random person. If the only house they look at is your house, it sure looks better! He also said to use the Facebook ad techniques available for free to target that house marketing. You can show your ad to ONLY people in a certain area, and only to people who are looking for houses, investment houses, etc. That way, when you spend money on a Facebook ad, you are not paying for clicks that are totally irrelevant. I had actually already been doing that, but I know a lot of people just hadn’t thought of it. Our Google Analytics web overview, and location visitors came from. I took this to heart. As soon as I got home, I created an ad for our Saint John house off our business Facebook page (you have one of those, right? If not, I can tell you how to get one). I linked that ad to a page I created on our website that tells all about our house and gives people OUR agent phone number and a form to fill out to get more information. That then gives us people’s email addresses for future marketing. Yay. There’s also a link to the official listing for the house, but it’s at the bottom of the page. I’ve been running the ad for three days. 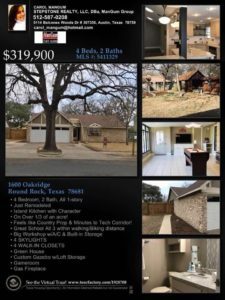 The bad news is that no one has bought the darned house, but we sure have shown it to a lot of people in San Antonio, where the house is located. These are people who are shopping for homes for themselves or as investments, since the house would be a great rental. I’ve shared the results here, since I have nothing to hide! The top image shows that we’ve exposed the ad to over 4,000 people, and almost 400 of them have clicked on it. That’s 9% or so. Really GOOD, considering the 1% you get from postal mail. We also got a few page likes from the ad, which is a bonus! 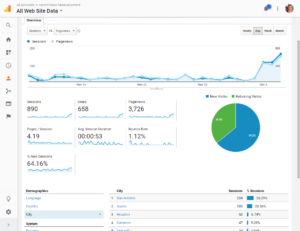 The second image is our last month’s hits, as of yesterday. 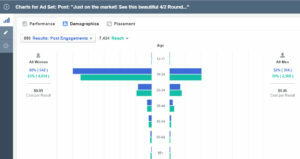 This should make it obvious that a Facebook ad will send people to your site! Now, we already have a general ad running, to get Facebook likes, and it gets us 15-20 a week. Most of our other hits come from sharing this blog on Facebook, Twitter, and LinkedIn. But this new ad certainly has caused a spike! If you look at the bottom of the image, you’ll see the location where visitors are from. Usually #1 is Austin, followed by Dallas, Houston, and Cameron (we do try to market to our general area). But, yesterday over a quarter of our visitors were from San Antonio! So, if this evidence doesn’t show you that a Facebook ad is worth it, I don’t know what does. I sure hope someone buys this cute house in an up-and-coming neighborhood soon! As the Social Media Director of this little organization, I think a lot about how to use social media to get business done. I have taken in-person and online courses, read a lot of books, participate in online groups, and talk to my fellow social media mavens as much as possible, but there’s always more to learn. I’d be really interested in hearing what some of you out there who have real estate investment, rehabbing, or wholesaling businesses do to encourage people to follow your website, blog, Facebook page, Instagram, Twitter, or other social media accounts. I blog often. Sometimes people read it. Trusting that some of you will share your ideas with me, I’ll share a few little things that I do, as well as a couple of gems from friends. Maybe they will spark ideas for you!